Cyclone Idai is one of the worst weather-related catastrophes in the history of Africa. We look at the forecast for a region under the threat of climate change. The New York Times: “Mozambique’s Cyclone: Mapping the Destruction of Idai” — “A tropical cyclone struck Mozambique and several other countries in southern Africa late last Thursday, causing widespread flooding and destruction across the southeast corner of the continent. The port city of Beira in Mozambique was hit hardest, with many homes destroyed. “At least 242 people have been killed in Mozambique, 139 people in Zimbabwe and 56 people in Malawi, according to the United Nations Office for the Coordination of Humanitarian Affairs. Aid organizations said those figures could rise drastically as rescuers reach previously inaccessible areas. 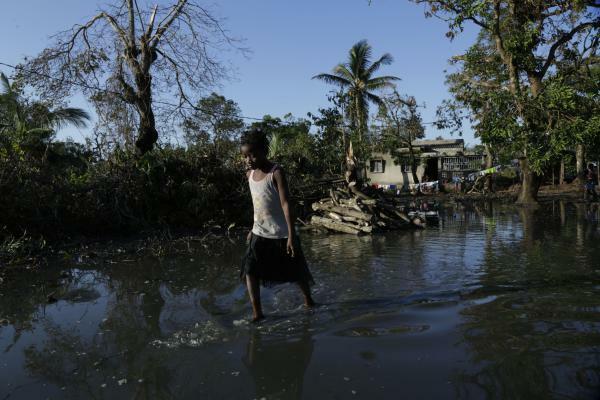 “The floodwaters from the cyclone, called Idai, could have reached almost 20 feet deep, according to Matthew Cochrane, a spokesman for the International Federation of Red Cross and Red Crescent Societies. Thousands have been displaced by the storm, and President Filipe Nyusi of Mozambique said the death toll there could climb to more than 1,000. The Guardian: “Cyclone Idai crisis deepens as first cases of cholera confirmed in Mozambique” — “The first cases of cholera have been reported in the cyclone-ravaged Mozambican city of Beira, complicating an already massive and complex emergency in the southern African country. “The announcement of five cases of the waterborne disease follows days of mounting fears that cholera and other diseases could break out in the squalid conditions in which tens of thousands have been living since Cyclone Idai struck on 14 March, killing at least 700 people across the region. “The first cases of the disease were confirmed in Munhava, one of the poorest areas of the hard-hit port city of Beira, the national director of medical assistance, Ussene Isse, told reporters. The city of roughly 500,000 people is still struggling to provide clean water and sanitation. Pacific Standard: “Why Tropical Cyclone Idai Had Such a Devastating Impact” — “Tropical cyclone Idai has made headlines across southern Africa throughout the month of March. Lingering in the Mozambique Channel at tropical cyclone intensity for six days, the storm made landfall in Beira, Mozambique, in the middle of the month, then tracked in a westerly direction until its dissipation. “The greatest impact of the storm was experienced on landfall. It caused flooding, excessive wind-speed, and storm surge damage in the central region of Mozambique. The adjacent countries of Malawi and Zimbabwe experienced severe rainfall, flooding, and damage from the high wind speeds. Madagascar also experienced bouts of high rainfall during the storm’s pathway to Beira.